Bamboo is being used more and more in our western society in building products, such as flooring and cabinets. We are also seeing sheets and clothing made out of this readily renewable resource. To welcome in Spring, I wanted to talk about the benefits of using Lucky Bamboo in your home, as a way of energizing growth and abundance into your spaces. Imagine my surprise when I did my research on the plant and found out that it is not actually in the bamboo family. Although not a true bamboo, in Feng Shui, the resilient Lucky Bamboo represents the Wood and Water elements, which relate to growth, success and prosperity, yet also demonstrate flexibility. If you add a red ribbon tied around the stalks, you have added the Fire element, and further increase the positive flow of energy or chi in the room. Other ways to add Fire is to use a red pot or one with an animal motif. You can find many Asian stores selling Lucky Bamboo in pots decorated with frogs, turtles, elephants and dragons. When planted in a round (Metal), ceramic (Earth) pot, you have incorporated all five Feng Shui elements – a perfect addition to any space for elemental balance. Lucky Bamboo is a wonderful addition in most areas of a home, particularly in the Health & Family and Wealth & Prosperity guas. I have several Lucky Bamboo plants throughout my home. The plant, pictured below, is in the Health & Family area of our dining room. It is in a place of honor, along with two beloved family heirlooms – the hand-carved wooden bar it is sitting on, which my mother won playing Bingo when we were stationed in the Philippines, and the porcelain Buddha on the right, which was a gift to my dad that symbolized our family (my dad was bald and there are five kids in our family). The other Buddha was a gift to me from my mother. Having the Lucky Bamboo there brings a wonderful balanced energy to those memories, now that both of my parents have passed. 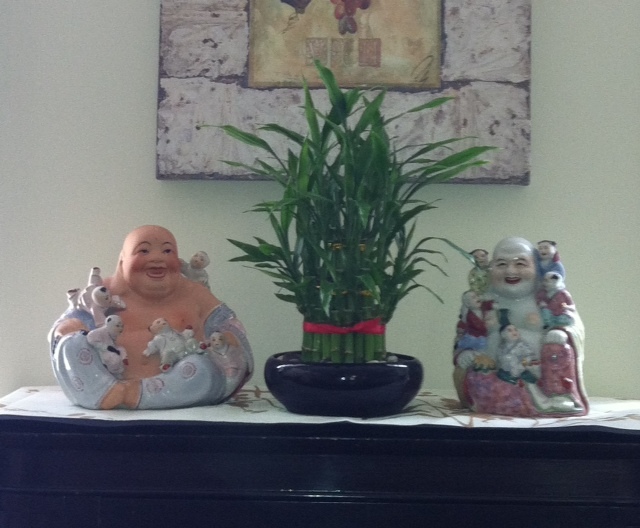 There are many good locations for a Lucky Bamboo because it brings in nature and a balance to most spaces. Living and family rooms are great locations. Consider placing one on your office desk – in the Wealth & Prosperity area (the far left corner), with the intent to bring in more financial success to your business, or in the Health & Family area (left side in the center), to bring in new growth and opportunities. Just be careful not to go crazy and place them everywhere, or you may become overwhelmed with too much new activity all at once! Intentionally place one and see how the energy responds. The one room I wouldn’t suggest putting a plant in is a bedroom. It could produce more yang energy than you want for sleep, especially when near the bed or in a small size bedroom. 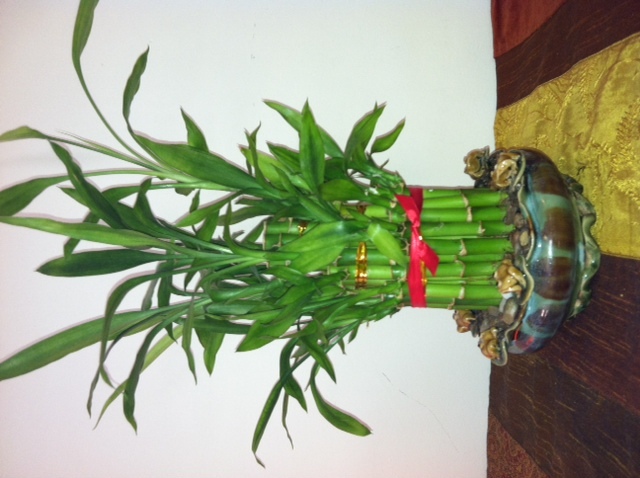 A Lucky Bamboo plant makes a great gift. Offer it with the intention of it bringing wonderful new energy, growth and success to the recipient’s life – perfect for a housewarming or birthday! You can also give one to someone who is recovering from an illness, surgery or accident, with the intention that it represents healing and new strength. Be sure the one you purchase is healthy, has room for water in the pot, and that the roots aren’t dry. I recently went to a large home improvement store and found that the pot was too small and the rocks on top were actually glued together so you couldn’t water the plant – not good Feng Shui for the poor plant! Just because they sell Lucky Bamboo does not mean that they are treated well. A florist shop or grocery store may have the healthiest ones around. If you don’t own a Lucky Bamboo yet, buy one. If you honor it by treating it well, you will be blessed with many years of beauty and wonderful energy!